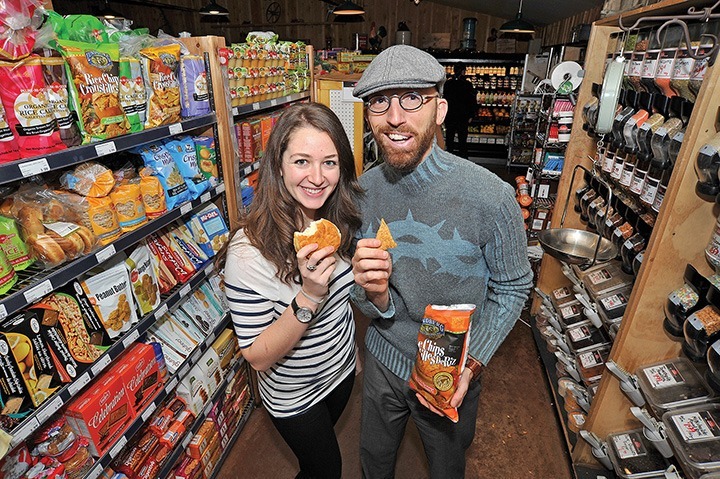 Alexandra Pony and Ari Hersherg have a taste of gluten-free goodies at the Red Barn Market on West Saanich Road as they get ready for the upcoming Gluten Free Health and Wellness Show Feb. 22 at the Victoria Conference Centre. It’s still another two months away, but excitement is building around the Victoria Gluten Free Health and Wellness Festival. Despite being a relatively new idea for Greater Victorians, eating gluten-free is a movement and philosophy that an increasing number of local residents are embracing, as a way of taking control of their diet and ultimately, their health and well-being. “Gluten intolerance is such a prevalent condition in society,” said festival spokesperson Alexandra Pony, who was diagnosed with celiac disease 10 years ago, but has only been able to maintain a truly gluten-free diet in recent years. She points to the emergence of such vegan/raw food eateries in Victoria as ReBar, Café Bliss and the newly opened Be Love, and the fact most restaurants offer some level of gluten-free options as a sign this is more than simply the latest health craze. The festival, the brainchild of online marketing guru Ari Hershberg, happens Feb. 22 at the Victoria Conference Centre. It brings together gluten-free vendors, offers food and fermentation demos, includes yoga sessions and perhaps most importantly, allows attendees to hear the latest on nutrition and food sustainability issues from experts in the field. A side dish of the festival is an intimate dinner Feb. 21 with cardiologist Dr. William Davis, author of the 2011 New York Times bestseller Wheat Belly. Davis, who will also speak at the conference centre Feb. 22, has campaigned against what he calls the “perfect poison” that is modern wheat. Tickets for the dinner, at Be Love restaurant, are $75 and seating is limited. Davis’ Feb. 22 talk is also a ticketed event. Visit glutenfreefestival.ca for more information. Okanagan-based Advanced Home Care Solutions is the latest seniors-focused company to enter the growing market for such services in Greater Victoria. Clinical director/founder Kris Stewart, said to be one of 12 people in Canada designated as a professional geriatric care manager, is working here with other professionals, including longtime home care nurse Jennifer Lang, to develop care-at-home plans for families wishing to keep their elders out of care facilities. More RNs and LPNs will be added to the team as needed, Stewart says. Visit advancedhomecaresolutions.com for more information. Helping patients get to the bottom of their foot problems is a major area of focus at Centerline Reflexology, a new venture from certified reflexologist Nicole Costello. A practitioner of occidental and oriental forms of the form, she offers a mobile service that allows clients to be treated in their home. Her varied background has seen her work as an art instructor, an engraver and a sculptor. Find her on Facebook at Centerline Reflexology. Just in time for the Christmas shopping season, Kristine and Tim Flater opened their third location of Knickerbocker’s, at Uptown. The jewelry and home accessories retailers, who opened their first store in 2007, carry some imported products but do their best to maintain a “keeping it local” mandate, featuring a variety of B.C.-made jewelry and pottery. Other stores are in Sidney and Broadmead Village. Visit knickerbockers.ca. David Manga’s Outset Media Corporation, sellers of such popular non-electronic games as Canadian Trivia, American Trivia and the Noggins Workshop series, was named Canadian Supplier of the Year among medium-sized businesses at the recent Canadian Gift Association awards. Saanich-based Outset, known for its environmental stewardship practices, was established by Manga in 1996 as an alternative to video games. Victoria based non-profit Synergy Sustainability Institute has launched the pilot for its Vancouver Island Green Business Certification program. Designed to help businesses become more sustainable and teach consumers to shop accordingly, the program – it has gold, silver and bronze levels – is expected to see a full launch in early 2014, according to institute executive director Jill Doucette. The goal in developing the certification program, she says, was to make it transparent, affordable for businesses and third-party verifiable to give it public credibility. For more information and participating businesses, visit synergyenterprises.ca. Vanessa Waters’ Verbena Floral Design was named best overall wedding florist for 2013 at the recent 2013 Professional B.C. Wedding Awards. The floral design team submitted their work from a summer Victoria wedding. The six-year-old company specializes in creating large arrangements and installations that transform conference rooms and other large spaces into a floral paradise with a mixture of local and exotic greens and flowers. Find more at verbenafloraldesign.ca. Send your business news to ddescoteau@vicnews.com. Don Descoteau’s column returns in the new year.